He joined the SMA in 1998 doing his Philosophy studies in India, followed by an International Spiritual Year programme in the Philippines. He became an SMA member in June 1998 and was then sent to Nigeria for his pastoral training. Fr Dominic completed his theological studies in Nairobi, Kenya. 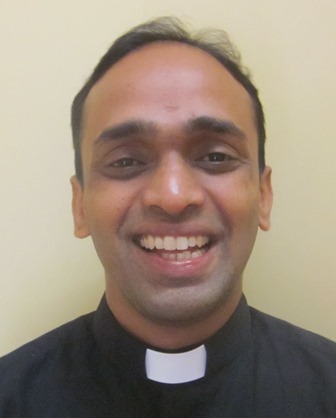 He was ordained a priest on 8 August 2009, one of 5 Indian SMA priests ordained that year. Pictured on right is the Chapel at the SMA Formation House in Mangadu, Chennai in India where Fr Dominic began studies with the SMA. After ordination Fr Dominic was appointed to Kontagora Vicariate, Nigeria. He spent some months learning the Hausa language with Fr John O’Keeffe (from Cork City) after which he went to Shafaci parish, where Fr Donall O’Cathain (from Cork City) was the Parish Priest, caring for 128 outstation villages. There are no tarred roads in the area and the priests use motorbikes or a 4×4 pickup to reach some outstations, some as far away as one and a half hours driving (i.e. about 50kms). They measure how long it takes to get somewhere by time rather than the length of the road. All roads in the area are laterite. Earlier this year Fr Dominic succeeded Fr O’Catháin as Parish Priest. Sharing the work with him now is another Indian SMA, Fr Maria Valan. Fr O’Catháin has moved further west to establish a new parish at Pissa (with 66 outstations culled from Shafaci together with 14 from the neighbouring parish of Guffanti), closer to the border with the Benin Republic. 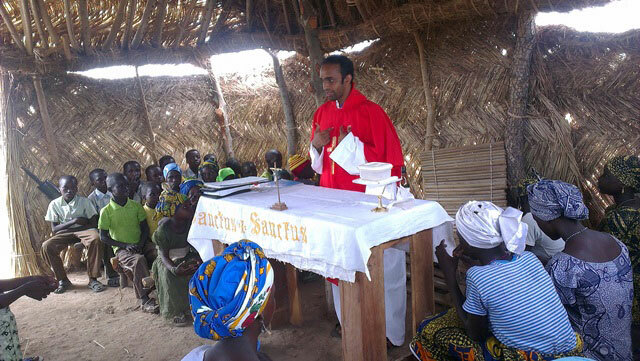 Fr Dominic is pictured preaching during Mass at an Outstation Church. This community will not have Mass again for several months. In his absence the community will gather for a Sunday Service of the Word, led by a community member who has been trained for this ministry. All three priests are heavily involved in the normal parish ministry (celebrating sacraments, teaching catechism etc) as well as training Catechists / Service Leaders (local villagers, women and men, who prepare children and adults for sacraments as well as lead the Sunday Prayer Service). Two of the pastoral priorities in Kontagora are the provision of clean water and the Dry Season Literacy programme. Shafaci has been involved in both since its establishment in 2001. There is a Healthcare clinic run by the OLA Sisters once a week on market day, with another clinic at Pissa also on market day. Youth Ministry is another ministry that the priests are greatly involved in because our churches are full of youths, children and women. Courses and seminars are held in different parts of the parish to address issues identified by the people: human rights, health education, empowerment of women through literacy, environmental awareness and justice and peace are some of the topics addressed at these gatherings.